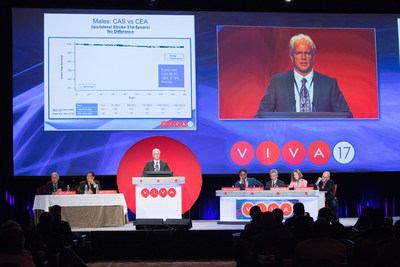 LAS VEGAS, Sept. 13, 2017 /PRNewswire-USNewswire/ -- VIVA Physicians, a not-for-profit organization dedicated to advancing the field of vascular medicine and intervention through education and research, announces the final five of 20 highly anticipated late-breaking clinical trial results at VIVA 17 hosted at the Wynn Las Vegas. Presented by Jennifer Ash, M.D. The LUCY study is the first prospective multicenter study to assess outcomes in women compared to men treated with the Ovation stent graft system (Endologix) for elective abdominal aortic aneurysm repair. The 30-day results of the 76 women and 149 men enrolled show that compared to men, women had more complex anatomy. Technical success was achieved in 100% of the women and 98.6% of the men. No women underwent a secondary intervention for endoleak, occlusion/stenosis, or migration compared to two reinterventions in the male arm for type Ia endoleak. The early results of the LUCY study show that women derive similar benefits with the Ovation system compared to men. Presented by Gary Ansel, M.D. PREVEIL is a prospective, United States, multicenter, single-arm trial to assess the safety and feasibility of the SurVeil drug-coated balloon (DCB) (Surmodics) in the treatment of subjects with de novo lesions of the femoropopliteal artery. The study enrolled 13 patients at three clinical sites with symptomatic femoropopliteal lesions ≤ 90 mm in length. Acute success measures of safety were achieved in 100% of subjects. At 6 months, subjects treated with the SurVeil DCB demonstrated primary patency of 100% and mean late lumen loss of 0.27 ± 0.54 mm. Subjects experienced significant improvement in Rutherford classification, ankle-brachial/toe-brachial index, 6-minute walk test, and walking impairment questionnaire at 30 days and 6 months. Median plasma concentration peaked immediately postprocedure (Cmax 1.07 ng/mL) and was undetectable at 30 days. Secondary technical, device, and procedural success criteria were achieved. Presented by Marianne Brodmann, M.D. This study evaluates the safety and efficacy of the Serranator Alto percutaneous transluminal angioplasty serration balloon catheter (Cagent Vascular) in subjects with atherosclerotic disease of the superficial femoral and popliteal arteries. The device has four external metal serrated strips embedded on a semicompliant balloon to create multiple longitudinal lines of interrupted microserrations to aid arterial expansion. Subjects with stenosis > 70%, lesion length ≤ 10 cm, and reference vessel diameters of 4 to 6 mm were included. Occlusions were allowed up to 6 cm in length. The primary safety endpoint was a composite of major adverse events plus perioperative death 30-days postprocedure. The primary efficacy endpoint is defined by device success with a final diameter stenosis < 50%. Twenty-five patients were enrolled at four study centers. The average pretreatment stenosis was 88% with a posttreatment stenosis of 23%. Only one stent was placed (4%) post-Serranator. There were no major adverse events or perioperative deaths at 30 days. Presented by Edward Woo, M.D. SAFE-DCB is a prospective, United States multicenter study designed to assess the on-label use of the Lutonix 035 DCB catheter (Bard Peripheral Vascular) for the treatment of de novo or restenotic lesions in the native superficial femoral or popliteal arteries in a real-world patient population. A total of 968 patients at 74 centers fulfilled all the study requirements. This per-protocol group had symptoms of intermittent claudication or critical limb ischemia, obstructive lesions up to 150 mm in length, and reference vessel diameters of 4 to 7 mm. To date, 627 per-protocol patients have reached the 12-month follow-up, and all evaluable 12-month data are included in this analysis. An early look at the primary endpoints showed the 30-day freedom from safety events was 98.5%, while 12-month freedom from target lesion revascularization was 90.8%. Presented by Sean Lyden, M.D. This case review evaluated the first-in-human experience with the newest-generation Ovation stent graft, the Ovation Alto (Endologix), intended to accommodate the widest range of anatomies for on-label endovascular aneurysm repair (EVAR) compared to other commercially available devices. Described in the review are the first seven patients treated with the Ovation Alto stent graft at a single center from August 2016 to February 2017. The ability of the Ovation Alto to fundamentally expand EVAR indications mainly relate to the unique sealing mechanism and the delivery system. Ovation Alto was successfully delivered and deployed in all patients with 100% technical success. At 30-day follow-up, no type I or III endoleaks, stent graft migrations, abdominal aortic aneurysm rupture, abdominal aortic aneurysm–related mortality, or secondary intervention were reported. VIVA Physicians strive to be the premier educators in the field of vascular medicine and intervention. Our team of specialists in vascular medicine, interventional cardiology, interventional radiology, and vascular surgery is driven by the passion to advance the field of vascular medicine with a spirit of collegiality by synergizing their collective talents to promote awareness and innovative therapeutic options for vascular disease worldwide. To learn more about VIVA Physicians, visit www.vivaphysicians.org.